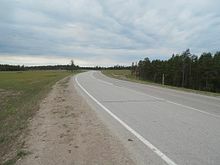 The R504 Kolyma Highway (Russian: Федеральная автомобильная дорога «Колыма», "Federal Automobile Highway 'Kolyma'"), part of the M56 route, is a road through the Russian Far East. 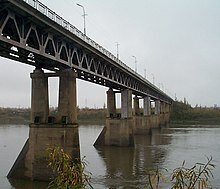 It connects Magadan with the town of Nizhny Bestyakh, located on the eastern bank of Lena River opposite Yakutsk. At Nizhny Bestyakh the Kolyma Highway connects to the Lena Highway. The Kolyma Highway and others in the region. The Kolyma Highway is shown in red. The Kolyma Highway is also known as the Road of Bones. Locally, the road is known as Trassa (Russian: Трасса – "The Route"), or Kolymskaya trassa (Russian: Колымская трасса – "The Kolyma Route"), since it is the only road in the area and therefore needs no special name to distinguish it from other roads. 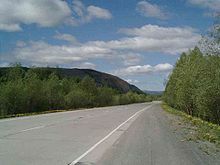 The Kolyma is paved 52 km. from Yakutsk (Nizhny Bestyakh) to Tyungyulyu. The road today near Magadan. Paving extends over the 150 km nearest to Magadan; elsewhere the road mainly comprises gravel. The Dalstroy construction directorate built the Kolyma Highway during the Soviet Union's Stalinist era. Inmates of the Sevvostlag labour camp started the first stretch in 1932, and construction continued with the use of gulag labour until 1953. In 2008, the road was granted Federal Road status, and is now a frequently maintained all-weather gravel road. When the road was upgraded, the route was changed to bypass the section from Kyubeme to Kadykchan via Tomtor, and instead pass from Kyubeme to Kadykchan via a more northern route through the town of Ust-Nera. The old 420 km section via Tomtor was largely unmaintained; the 200 km section between Tomtor and Kadykchan was completely abandoned. This section is known as the Old Summer Road, and has fallen into disrepair, with washed-out bridges and sections of road reclaimed by streams in summer. During winter, frozen rivers may assist river crossings. Old Summer Road remains one of the great challenges for adventuring motorcyclists and 4WDers. The area is extremely cold during the winter. The town of Oymyakon, approximately 100 km from the highway, is believed to be the coldest inhabited place on earth. The average temperature in Oymyakon in January is −50 °C. The Old Summer Road has become a challenge for adventure motorcyclists. After the fall of the Soviet government, the road was first traversed by Western motorcyclists in summer 1995, when the British Mondo Enduro team completed a crossing from Yakutsk to Magadan. Shortly afterwards a Norwegian wanderer Helge Pedersen also completed the road, starting from Magadan. In 2006, two French adventurers (Cyril Delafosse-Guiramand and Guillaume Tourlourat) walked to Yakutsk on the old road. Subsequent notable traverses by motorcycle include Ewan McGregor and Charley Boorman's round-the-world motorcycle journey in 2004, made into a popular television series, book and DVD, all named Long Way Round. However, due to the timing of the journey and the condition of the road, it was not possible for them and their support crew to complete the traverse unassisted. They instead joined a Russian freight convoy, whose trucks were able to ford the still swollen rivers. Simon Milward completed the road in 2001 by motorbike and it was cycled in the 2004 winter by Alastair Humphreys and Rob Lilwall, followed on foot by Rosie Swale-Pope in 2005 and ridden solo on motorcycle by both Adrian Scott and by Russian woman Sasha Teplyakova (via the Old Summer Road) the same year. In 2006, the Hungarian talk show host, Sándor Fábry, and the painter András Wahorn made an assisted trip on the road from Magadan to Yakutsk (using the Tomtor road) on a 30 years old Cadillac Eldorado Convertible car, as part of their Cadillac Drive TV show, driving from Los Angeles to Budapest. In 2007 the Polish Motosyberia team completed the Old Summer Road. In 2009 Walter Colebatch and Tony Pettie on the Sibirsky Extreme Project completed the new road, from Yakutsk to Magadan via Ust-Nera, in three and a half days. In 2010 Walter Colebatch returned to host the first commercial motorcycle tour on the Road, in which Sherri-Jo Wilkins became the first foreign female rider to ride the road. In September 2010, Paul and Dean Martinello together with Barton Churchill, completed the Old Summer Road into Magadan, and remain the latest motorcycle arrival to Magadan – 30 September. In summer 2012, Sean Ardley of California cycled the road from Magadan to the Lena River in 16 days, 12 hours. In June 2013, Nikolaos J. Kavouras member of Motorcycle Club of Kozani, was the first Greek biker who made the new road (via Ust-Nera) in four days, completed his "mongolia2magadan" effort. Commercial trips for small numbers of motorcycles are available. The very first attempt to ride a motorcycle in winter condition was made by Dan Popescu, motorbiker, the Romanian Motorcyclists Association (AMR) president in late March 2012. He rode one Aprilia Pegaso 650 IE on the distance between Yakutsk to near Kyubeme in few days, including night time riding, the coldest temperature down to −35 °C, helped by a back up team in two 4×4s including an ambulance. The recent completion of the Old Summer Road was done during August 2015 by the leavinghomefunktion team, an international group of young artists on Ural motorcycles with side-cars. In July 2018, David Fletcher, Gary Rice (both from England, on Husqvarna 701) and Johannes Micheler (from Germany, on KTM 640 LC4) completed the Road of Bones via the old summer road. 350 km (220 mi) Krest-Khaldzhay Road, northeast, summer ferry across the Aldan River. Alternative: Summer Hydrofoil from Yakutsk down the Lena and up the Aldan, 530 km (330 mi), 10 hours. over Suntar-Khayata mountains, 1,200 m (3,940 ft) pass, Vostochnaya River. 940 km (580 mi) (New route) Ust-Nera on the Indigirka River, east: several mining towns, Artyk town, headwaters of the Nera River, 1,452 m (4,760 ft) pass. Alternative: (Old Summer Road route) 155 km (100 mi) northeast to Tomtor, 250 km (160 mi) road northeast (may not be passable except when frozen), into Magadan Oblast. 1,240 km (770 mi) Kadykchan (nearby are coal mines and the old Myaundzha uranium processing centre). There is also a scenic shortcut from Magadan to Susuman via Ust-Omchug called the Tenkinskaya Trassa, which receives a lot less heavy traffic than the main section of the M56 between Magadan and Susuman. Distances: Yakutsk to Khandyga 380 km (240 mi), on to Kyubeme 320 km (200 mi), to Kadykchan (via Tomtor) 420 km (260 mi), Kadykchan to Susuman 90 km (60 mi), Susuman to Magadan 630 km (390 mi). From Kyubeme to Kadykchan north via Ust-Nera (the new, maintained section) is about 650 km (400 mi). As of summer 2010, the Old Summer Road via Tomtor was still passable to motorcycles and 4×4s. The Anadyr Highway from the Kolyma Highway to Anadyr in Chukotka has started construction. It will pass Omsukchan, Omolon and Ilirney. There will also be branch roads to Bilibino and Egvekinot, and involve construction of 1,800 kilometres (1,100 mi) of road. It is expected to take 8 years to finish, planned to be ready in 2025. The construction of the first 50 kilometers of the road started in 2011–2012. The road will be a gravel road. ^ Warren, Marcus (10 August 2002). "'Road of Bones' where slaves perished". The Daily Telegraph. London: TMG. ISSN 0307-1235. OCLC 49632006. Retrieved 5 February 2012. ^ Westcott, Gary & Monica (2012). "Road of Bones to the Coldest Place in the World –". Russian Life. Retrieved 5 February 2012. ^ Colebatch, Walter. Siberian Extreme 2010 – Back for More, 8 July 2010. Retrieved 25 July 2014. ^ p. 57, Extreme Weather: A Guide & Record Book, Christopher C. Burt and Mark Stroud, New York: W. W. Norton & Company, 2007, ISBN 0-393-33015-X. ^ Погода и Климат. Retrieved 25 July 2014. Wikivoyage has a travel guide for Kolyma Highway. Zoltan Szalkai made a documentary of Gulag camp of Kolyma. 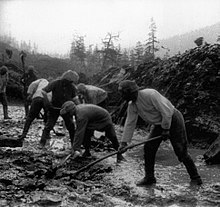 Documentary *** GOLD*** - lost in Siberia  was filmed in the summer of 1993 in Magadan, along the Road of Bones, through Ust-Umshug and Susuman and at the Sverovostok Zoloto gold mine, Siberia, by the first foreign film crew ever, visiting the Kolyma District -which had been under control of the Soviet secret service, under the company name Dalstroj, for over 60 years.